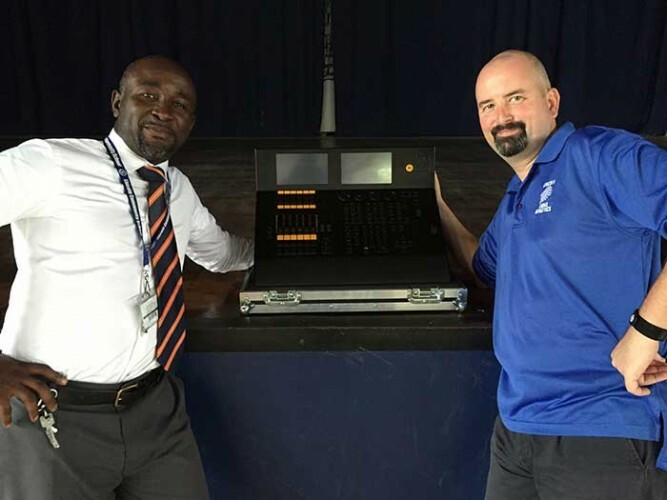 Lincoln Community School in the Ghanaian capital of Accra is has taken delivery of a new dot2 core console, which will be used to control LED lighting in their multi-purpose hall, which is utilised for various sporting activities as well as to stage productions and general events. Lincoln’s high school drama and film studies teacher Iain Cowieson was searching for a company to deliver and install a new lighting system for the hall, and discovered DWR Distribution, MA Lighting’s South African distributor, based in Johannesburg, on the internet. By an incredible stroke of luck, DWR technical African sales representative Johnny Scholtz just happened to be in Accra working on another project when the office received the call, so was able to visit immediately and access the situation. He met Iain and the school’s chief procurement officer Anthony Quainoo, who discussed their needs and invited him to propose a specification for some new LED lighting and control. “We were impressed by his professionalism and understanding of our situation and the clarity and flexibility of his recommendations,” commented Iain, adding that it was definitely a case of “right place – right time”. Johnny takes up the story: “They needed a cost-effective, easy to maintain and use system, so I proposed LED PARs and a dot2 core for control to start off with”. This proved a perfect solution on several counts! Having never had a console before – previously the old lights were switched on and off manually – they needed something that was first-and-foremost logical and easy to use, explains Johnny, adding that the “rock solid” dot2 software was the perfect answer. They also wanted a product they could grow into, learn and expand their knowledge of lighting control, as the plan is to add more stage and house lighting fixtures into the system as capex becomes available. “dot2 ticked all the boxes and also fitted nicely into their budget,” says Johnny. DWR also supplied a selection of LED PAR lights chosen for their power saving capabilities and general adaptability. Training was integral to the package, and Iain and other staff received basic instruction from Johnny on the dot2 which they could then share with students using the lighting. “The dot2 is absolutely brilliant,” declares Iain who, along with other staff, has found it very simple to pick up and be able to programme and execute cues, choose and change colours etc. He also intends to explore the more complex operations of the dot2 as he gets used to the console. While they may not yet need to plumb the deeper technical depths of the dot2, the important thing is that there is plenty of headroom. “Having only worked with traditional lighting systems before I am flabbergasted at the power, possibilities of DMX and of the desk itself,” he stated, adding that their technology coach Ryan Harwood who also attended the technical training became very excited about having kit with such great potential available! “Introducing the dot2 at this stage also ensures there is a degree of future proofing for the school,” adds Johnny, emphasising that the reliability factor was again crucial in the console spec as a supplier – with a minimum six hour flight to reach Accra, minimising technical call-outs was essential! Lincoln Community School was founded in 1968 and is a private non-profit, college-preparatory international school with around 750 scholars from 85 different nationalities. The curriculum is based on the international Baccalaureate (IB) system, and the numerous high end facilities include the multi-purpose hall which is used as a gym and basketball and volleyball court, with the stage for entertainment performances and presentations on the one end. In picture: Anthony Quainoo and Iain Cowieson with the dot2 core.